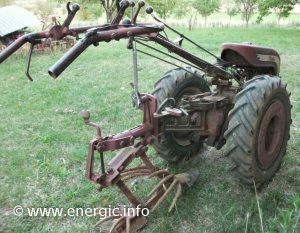 Energic motoculteur 215 motor Bernard 3 gears forward 1 reverse. 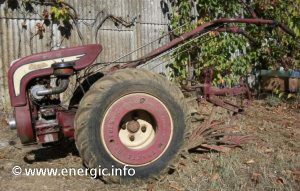 Energic series 210; (1/05/1963), Model A; 215 5cv (223kgs) 3,397/3,416 frs. Model B; 215 5cv (223kgs) 3,589/3690 frs. 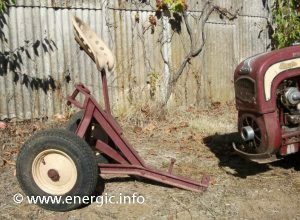 There are 2 models in the Energic type 215; model A only for rotivation; (223kgs) 3,397/3,416 frs. 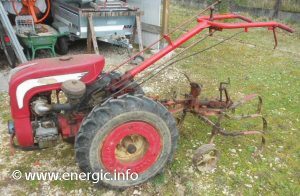 Model B; for all ploughing/labour and rotivation; 215 5cv (223kgs) 3,589/3690 frs. (1/05/1963). (you do not have to take the wheels off to rotivate on this model). Engine/Moteur. 4 stroke, moteur Bernard 110 BIS 5cv @ 2500 rpm., Single cylinder, 4 stroke, Alésage 69mm x Course 64mm. 240cm3. Air cooled. Cylinder head/Carter – aluminium with special metal cylinder lining. Cylinder head Hemispheric, with Over head valves (OHV). The piston is made up from a mixture of aluminium-silicon and copper for maximum resistance under load. Push rods are regular able, The Crankshaft is mounted on regulated roller bearings with sealing rings at each end giving full safety against the introduction of dust inside the casing. Centrifugal regulator. 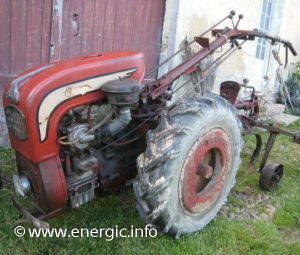 Energic motoculteur 215 moteur bernard 5 cv. Energic motoculteur 215 model B.
Energic motoculteur 215 rear view. 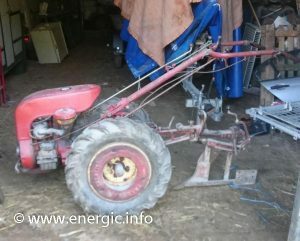 Energic motoculteur 215 with Sulky attachment.